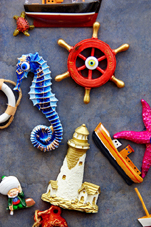 Nautical Christmas ornaments and lighthouse decorations add coastal style to a traditional Christmas celebration. Incorporate elements that reflect a nautical theme, such as rope, netting, and driftwood. Think sail boats, lighthouses, ship wheels, anchors, and yachts when planning this Christmas tree theme. Here you’ll find decorating tips for celebrating the holidays with coastal style, as well as a variety of nautical Christmas decorations and ornaments for your home and Christmas tree. What type of garland should you choose for a nautical theme Christmas tree? Red, yellow, gold, or blue bead garland makes a beautiful accent to nautical ornaments. Drape your tree with ribbon in nautical colors or prints. Combine rope, netting, ribbon, and beads for a unique Christmas tree garland. The best Christmas light strands for decorating a nautical Christmas tree are white, red, or blue. Complete this Christmas tree theme with a lighthouse tree topper and add a tree skirt in a nautical print or colors.